This gorgeous resort in Punta Cana is the perfect place to discover an elegant adults only vacation experience. On Bavaro Beach, enjoy a variety of daily water sports, fitness programs, yoga on the beach, world-class dining, and fabulous entertainment. Guests can enjoy full access to all amenities, services, and facilities at neighboring Royalton Punta Cana and, Memories Splash with the Caribbean’s largest on-site waterpark. All of the luxurious accommodations feature the Royalton Signature DreamBed™, WiFi, Rain showers, balcony or terrace and Satellite TV. 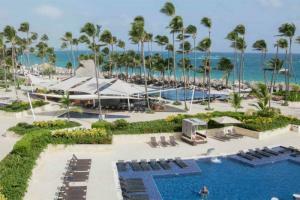 Located about 16 miles from Punta Cana International Airport.